West Sonoma Coast Rivers-Marie 2009 Pinot Noir MacPhail: Get On the Wagon Sips of Pinot & More (Good inexpensive Pinot Noir is not a misnomer) Pinot Briefs Etc. 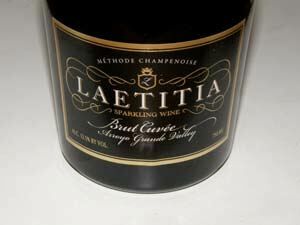 Laetitia Vineyard & Winery produces a broad range of premium varietal wines from its large estate vineyard located four miles inland from the Pacific Ocean in the Arroyo Grande Valley. The vineyards were first planted in 1982 by the French Champagne house Maison Deutz. In 1997, Jean-Claude Tardivat acquired the vineyards, renaming the estate Laetitia after his daughter. One year later, the winery was sold again to Selim Zilka, the founder of a successful wind power development company and champion of environmental sustainability. The estate vineyard comprises 1,888 acres, with 620 acres currently planted to grape vines, making it the largest privately owned Pinot Noir planting in California (434 acres). Lino Bozzano, a third generation California farmer, manages the vast vineyard. The label focuses on Pinot Noir but several other red and white varietals are produced. Winemaker Dave Hickey started at the vineyard when it was still Maison Deutz in 1990 and he now oversees sparkling wine production while his son, Eric Hickey, manages the production of Laetitia’s still wines. The winery has a tasting room in Arroyo Grande on Highway 101 that is open daily. Production is about 50,000 cases annually. 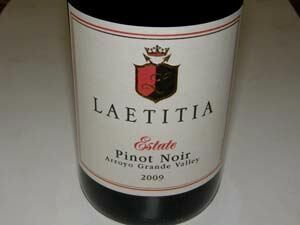 Visit the website at www.laetitiawine.com to acquire the wines reviewed below. 14.1% alc., pH 3.63, TA 0.592, $25. Multiple clones including 113, 115, 459, 667, 777, 828, Pommard 5, 2A, Martini 13 and Mt Eden. 100% de-stemmed, 3-day cold soak, quick fermentation. Aged 11 months in 30% new and 70% neutral French oak barrels. · Moderate reddish-purple color in the glass. Nicely perfumed with aromas of spiced berries, black cherries, cassis and prune, persisting in the glass over time.The palate is all Pinot with riper flavored fruits featured including dark red raspberries and cherries, embellished with a hint of Asian spice, and clothed in soft tannins. Smooth in the mouth with an underlying nerve of acidity that brightens the fruit. This bottling is a consistent performer with good value. Very Good. 13.5% alc., pH 3.42, TA 0.663, $18. Dijon clones 96 & 97, Wente 17 and 4. Whole-cluster pressed and 100% MLF. Aged 9 months in 25% new and 75% neutral French oak barrels. · Very light straw color in the glass. Shy aromas of baked apple lead to medium-weight delicate flavors of Asian pears, lemon and green apple. Restrained in character but satisfying. Nicely avoids prominent oak and oak-derived flavors so common in California Chardonnay today. A solid pick. Good (+). 12.5% alc., pH 3.1, TA 0.82, $22. Chardonnay, Pinot Noir and Pinot Blanc grapes. Whole-cluster pressed and tank fermented using Champagne yeast. Crafted in Méthode Champenoise tradition. 24 months en tirage. · Pale gold color in the glass with a fine bead. Bright aromas of apples, pears, honey, roasted nuts and vanilla. The flavors follow in step with a crisp, tightly wound offering of green apple, Asian pear, and lemony wafer goodness. Bone dry and lively, displaying a bright nerve of acidity. Very Good. 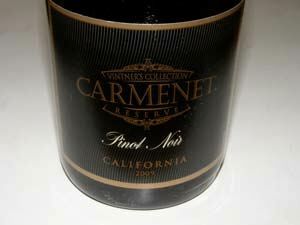 Carmenet Vineyards is a long-standing and well-respected California label previously part of the Chalone group of wineries but now owned by Bronco Wine Company. The winery offers a collection of Vintner’s Reserve wines from the California appellation that are widely distributed and represent excellent value. 12.5% alc., pH 3.56, TA 0.341, $11.99. · Moderately light reddish-purple color in the glass. Aromas of black cherries, underbrush, mown hay and oak. Tasty core of juicy black cherry and dark berry fruits with a hint of anise, savory herbs and oak. A lighter offering with good structural integrity and charm. A solid wine at this price, and an excellent introduction to Pinot Noir for newbies or an acceptable daily drinker for pinotaficionados. Good. 12.5% alc., pH 3.41, TA 0.555, $11.99. · Light straw color in the glass. Delicate but alluring aromas and flavors of white peaches and pears with a hint of citrus and oak. Crisp and pleasing. The low alcohol is a favorable feature. A perfect everyday wine that works as an aperitif or food compliment. Good (+).